Elizabeth Tikvah Sarah studied Sociology at the London School of Economics (1974-77) and Rabbinics at the Leo Baeck College in London (1984-89), where she received ordination and was awarded a distinction for her rabbinic thesis. She has been a pioneer in the area of lesbian and gay inclusion, initiating a process within Liberal Judaism, which culminated in a new policy on lesbian and gay individuals and relationships in 2002, and the creation of an anthology of ceremonies, which was published by Liberal Judaism to coincide with the Civil Partnership law coming into force in December 2005. Subsequently, in March 2006, she married her partner, Jess Woo (MBE in the New Year’s Honour’s List, 2012) at her synagogue, Brighton and Hove Progressive. Prior to her rabbinic studies she engaged in feminist activism, research, writing and editing. A member of Lesbian Line (1979-1982) and the Women’s Research and Resources Centre collective (1979-1984), she was Assistant Editor of Women’s Studies International Forum (1979-1984), edited Reassessments of ‘First Wave’ Feminism (Pergamon Press, 1982), and co-edited, Learning to Lose – Sexism and Education (with Dale Spender, Women’s Press, 1980) and On the Problem of Men (with Scarlet Friedman, Women’s Press, 1982). She was also a member of the Jewish feminist collective that created the Jewish feminist magazine, Shifra, in 1984. Since ordination she has worked as: Rabbi of Buckhurst Hill Reform Synagogue (1989-94), Director of Programmes for the Reform Synagogues of Great Britain and Deputy Director of the Sternberg Centre (1994-97), a Rabbinic Tutor at the Leo Baeck College (1994-2009), Chair of the Leo Baeck College Rabbinic In-Service Training Team (1996-2002), a Lecturer at Leo Baeck College, teaching ‘Classical Hebrew’ and ‘Spirituality’ (1997-2002), Rabbi of Leicester Progressive Jewish Congregation (1998-2000) and Rabbi of Brighton & Hove Progressive Synagogue (2000-current). 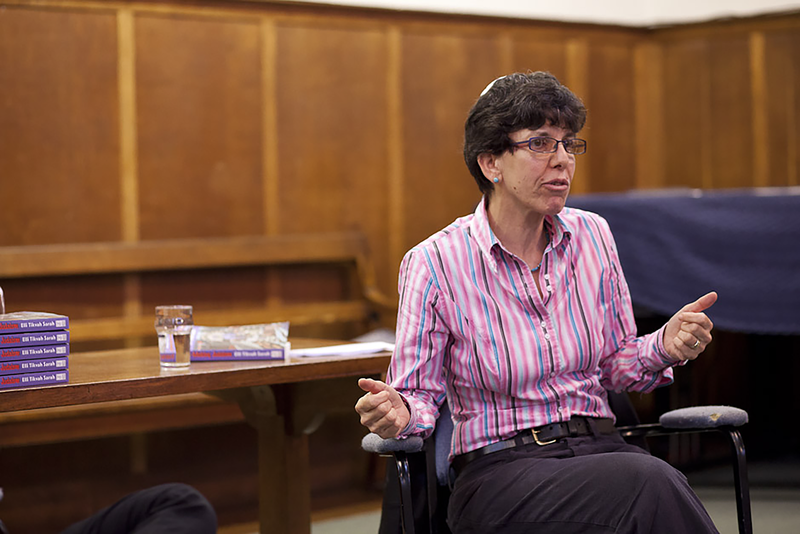 In addition to her role as Rabbi of BHPS, she is also Liberal Jewish Chaplain at Sussex and Brighton Universities. Since 1994, she has been a member of the Manor House Abrahamic Dialogue Group. Her media appearances include participating in Joan Bakewell’s ‘Heart of the Matter’, with Peter Tatchell and others (BBC 2, February 1996), a Sunday morning TV panel discussion with Rabbi Shmuley Boteach and Michael Freedland (1998), a Sunday morning ITV studio discussion (1998), being interviewed by Joan Bakewell for the Radio 4 ‘Belief’ series (January, 2007), and numerous local radio interviews, including, most recently, for BBC Sussex, where she has also delivered two ’60 second sermons.’ In June 2011, she was on Channel 4’s ‘4thought’ and on 15 April 2012, she was a guest on BBC 1’s The Big Questions. A writer, in addition to editing three books, she contributes a monthly article to Sussex Jewish News and has contributed over four dozen articles and several poems to various journals and anthologies. She also teaches and lectures in many settings on a variety of topics and has delivered three conference sermons and four conference ‘key-note’ lectures. Her book, Trouble-Making Judaism, was published on February 1st 2012 (David Paul Books).